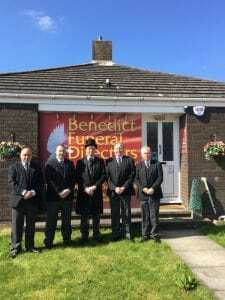 Benedict Funeral Directors are Arlesey based undertakers who are ideally suited to provide funeral services for residents of the Arlesey Area. Being a family run Undertakers brings certain advantages, namely you are assured of our personal touch; total respect, honesty and compassion. Part of that respect is to let you know the options that are available to you in Arlesey; funerals are one off events and they can be relatively simple or very extravagant. One of our funeral homes, with it’s choice of two chapels of rest, is actually in Arlesey. Our other funeral home is located in Houghton Regis. Of course cremation is not the only option; there are different cemeteries available for burial (as opposed to being cremated). Benedict funeral Directors are more than happy to discuss this with you. Central Bedfordshire Council, which is the District Authority covering Arlesey, has several cemeteries via it’s town councils, which includes Arlesey Cemetery in Hitchin Road. However due to flooding, burials are currently being restricted at this location until further notice. Arlesey can be served by Bedford Cemetery Complex, 104 Norse Road, Bedford, MK41 0RL.